From the Bloody Scotland website: "The winner of the Scottish Crime Book of the Year will now be awarded The McIlvanney Prize at an awards ceremony on the opening evening of Bloody Scotland, Friday 9 September in Stirling." 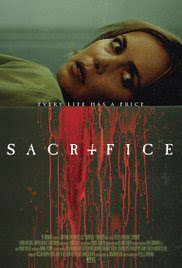 Scheduled at 10pm on Sunday night on Channel 5 is the film version of Sharon (SJ) Bolton's Sacrifice. The cast includes Radha Mitchell (as Tora) and Rupert Graves (as Duncan). 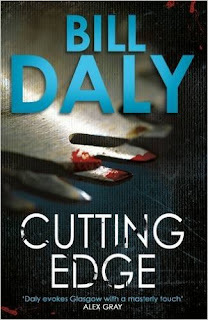 CUTTING EDGE is the third Glasgow DCI Charlie Anderson book by Bill Daly and it is really brilliantly gripping. Given the number of police procedurals that are published each year, it is very pleasantly surprising to discover an author who writes in a way that does not conform to a very predictable pattern. His protagonist DCI Charlie Anderson is a policeman of senior years and a veteran of many previous cases. This one opens on an ordinary day in June 2011 when a serial killer sends Charlie a parcel which contains the severed left hand of a victim who turns out to be an elderly gypsy. The parcel, contains a shoe box and in that, together with the severed hand, there is also a playing card. There are no identifying finger prints or DNA left on the parcel which was posted from a large post office in the usual way. Soon a range of victims are being targeted including a heroin-addicted mercenary and a female accountant and their severed left hands are being removed and posted to Charlie and later the corpse of each victim is discovered. The media are involved and it soon becomes a high-profile case with much pressure from the top brass in the Glasgow police to relieve negative public opinion with a quick resolution. Soon Charlie's own family are being targeted and his wife and daughter have to go into hiding to safeguard them and there are tensions in the team of detectives hunting the deranged killer. The book, since it contains many gory descriptions is not for the squeamish but I did not think it was unnecessarily violent but others of a more sensitive nature may be offended but I think it is important to emphasise the author is attempting to reproduce an accurate portrayal of daily life in a busy police station. Could the killer be a recently released prisoner who was jailed as a result of Charlie's evidence? This and many other possible leads are investigated by Charlie and his team of detectives. The locality of Glasgow is well evoked with plenty of references to the Scottish diet and humour as well as street names. I had the pleasure of reading for review purposes his previous books DOUBLE MORTICE and his debut DCI Charlie Anderson novel BLACK MAIL and his present book is well up to his usual high standard. I truly loved reading CUTTING EDGE which was immensely enjoyable but at 320 pages I thought too short as I didn't want it to end. I will definitely look out for further books by this greatly talented British author who now lives and works in Montpelier France. Extremely well recommended. Makana is watching the sky lighten. After another sleepless night he wonders how much longer he can live on this decrepit houseboat. Every bone aches as he smokes a cigarette and considers his latest case: the apparent disappearance of a young engineering student who has not been in touch with his family for three weeks. His thoughts are interrupted by his landlady's daughter who drags him along the river bank to where a fisherman has hooked a grisly catch, a severed head in a sack. Police Inspector Okasha arrives with his posse of uniforms and brings with him the formidable Chief Forensic Officer, Doctora Siham. She pinpoints a scar pattern on the victim's forehead as belonging to one of Makana's fellow Sudanese, although from the South. Okasha remarks that if the victim is from South Sudan he can't see anyone rushing to solve the mystery, the South Sudanese are not popular in Egypt right now, with their protesters encamped in Maidan Square for months, demanding their right to asylum. 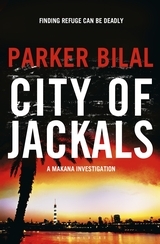 Parker Bilal is the crime pseudonym of British-Sudanese writer Jamal Mahjoub who writes fiction and non-fiction under his own name and whose current project is a contemporary history of the North-South Sudanese conflict. CITY OF JACKALS is the fifth novel in his gripping “Makana Mystery” series, set in Egypt in the years leading up to the Arab Spring and featuring Sudanese exile Makana struggling to make a living as a private investigator and battling his own demons that rise from his haunted and hunted past. The titles in the series often conjure Ancient Egyptian iconography and CITY OF JACKALS introduces us to the realm of Anubis, the dog-headed god who prepares his subjects for the underworld – for the life to come. This is Egypt on the brink of revolt, Mubarak has been elected back into power but protest is in the air. Makana's search for the missing student starts to uncover a life unknown to the rest of the young man's family. But at the same time he cannot forget the murdered Sudanese whose head was found in the river and he works to identify the boy and to find his murderer or murderers. The search takes him into the churches, camps and missions of the Sudanese refugees where he encounters Christian missionary zeal alongside open hostility. In CITY OF JACKALS Makana seems to be at some kind of exhausted cross-roads himself, the consequence of which is a darker, more conflicted atmosphere. The wit is still there but it is more subdued. The hospitable suppers at his favourite restaurant are less frequent. Makana's journalist friend Sami is also adrift – in his marriage and his job; even Makana's eager young helper, Aziza, now in her teens, seems angry at the hopelessness of her ambitions. However Bilal still conjures the living detail of Cairo, the street scenes, smells, vivid, rounded characters and the layers of a crowded city steeped in human machinations, corruption and hope. Bilal's writing remains sure and Makana's investigation sweeps towards an exciting, physically dramatic conclusion – a trademark Makana finish. You must always hang on to your hat when following the determined Makana's chase to the finish, so press that hat firmly on your head and follow him, you won't regret it. This year over 2,000 of you nominated your favourite books and authors for the Dead Good Reader Awards. We’re thrilled to now be able to unveil your shortlists. My list is rather short but there are longer lists in the comments on the Past Offences page. The shortlist for the Theakstons Crime Novel of the Year 2016 has been announced. In addition: "Val McDermid will receive the Outstanding Contribution to Crime Fiction Award, joining past winners Sara Paretsky, Lynda La Plante, Ruth Rendell, PD James, Colin Dexter and Reginald Hill." "The overall winner will be decided by a panel of Judges, alongside the public vote. The public vote opens on 1 July and closes 15 July at www.theakstons.co.uk." Read more about the shortlisted titles at the Harrogate Crime Writing Festival website. At CrimeFest, the longlists for the ten CWA Daggers were announced. I've borrowed this handy summary from Dead Good Books. Here's a snapshot of what I think is published for the first time in June 2016 (and is usually a UK date but occasionally will be a US or Australian date). June and future months (and years) can be found on the Future Releases page. If I've missed anything do please leave a comment. • Carter, Andrea - Treacherous Strand #2 Benedicta 'Ben' O'Keeffe, Solicitor, Inishowen peninsula in County Donegal, Ireland.